Idaho, in the western United States, is entirely landlocked. Interestingly, though, a series of locks and dams along the Snake River and Columbia River have created the furthest inland seaport on the western seacoast. 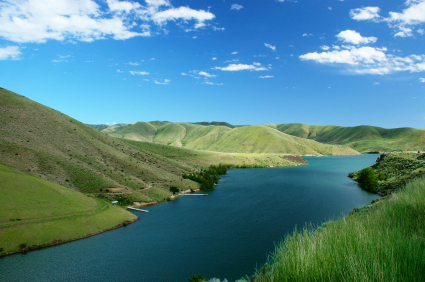 Idaho is made up of rugged mountain terrain in an area that is larger than all of the New England states combined. When you arrive in Idaho, you'll find many new insurance companies that were not available in your old state. These companies may offer discounts and cheaper rates that you would not know about unless you sought quotes through a comparison site like ours. Comparing rates ensures you get the best deal, even if you don't know all the insurance companies in the error. Start by knowing the state minimum coverage and consider additional insurance you might need before comparing quotes. Any UM coverage that is purchased must be equal to or more than the required legal minimum of bodily insurance required by the state. UIM disputes are handled under contract law in Idaho because there are no laws regarding this type of coverage. How much will you pay for car insurance in Idaho? Enter your zip code in the box to find out. When you become a resident of Idaho, you will need to transfer your out of state driver's license and register your vehicle with Idaho plates. Your local county sheriff's office handles all of the necessary paperwork at any Idaho Division of Motor Vehicles office. New residents are granted a certain period of time to complete their driver's license transfers without facing any fines or penalties. Idaho gives you 90 days to collect the appropriate documentation and visit a sheriff's office to make the license transfer. Anyone with a commercial driver's license must make the transfer to an Idaho license within the first 30 days of becoming a resident. If your out of state license has been suspended or revoked in another state, you will not be able to obtain a valid Idaho driver's license. Idaho requires that you surrender your out of state license when you are issued an Idaho license unless your previous license is from a different country. You may not use the out of country license as a means of identification or license to drive within Idaho. Anyone who is living in Idaho as a student or military employee is exempt from transferring their driver's license because they are not considered permanent residents by the state. Idaho requires proof of residency before you will be issued an Idaho driver's license. Acceptable documents include utility bills, payroll check stubs with a current Idaho address, enrollment paperwork from an Idaho school, or a mortgage or home rental agreement. General mail or package labels with your home address are not acceptable as proof of Idaho residency. Applicants for license transfers must also be able to prove their identity and age through an official document. If you can present a valid out of state driver's license, you will not need any further proof of identity or age. If not, you will need to bring a certified birth certificate, naturalization papers, or other form of identification that was issued by a government agency and includes your full name and a photo. The fees for Idaho licenses vary depending on your age and the length of time the license is valid. Drivers who are 17 years old will pay $15.00 for a 1-year license. A 3-year license for anyone age 18-21 will cost $25.00. You can obtain a 1-year license if you are 20 years old for $15.00. Drivers who are 21 and older can purchase a 4-year license for $30.00 or an 8-year license for $55.00. If you are age 62 or older you do not have the 8-year option any longer and must purchase a 4-year license. Every applicant for an Idaho driver's license must take a vision test. If you need to wear corrective lenses to pass the vision test, you must always wear those lenses when driving your vehicle. If your out of state license has been expired for a year or more, you will need to pass a written test to prove you understand the Idaho traffic laws, street signs, and street markings. Anyone who needs to transfer a license from another country or carries an out of state license that has been expired for a year or more will also need to pass a physical driving test. Registration transfers can be done at any Idaho county assessor motor vehicle office in the state. These offices have several locations throughout Idaho. The best way to find the closest office is to look it up in the local phone book, or check for online listings of the offices by county. People who live in smaller cities may need to travel to a larger city to find a local assessor motor vehicle office. You must appear in person at the office in order to properly transfer a registration from another state. Idaho requires that all vehicles be covered by a minimum amount of bodily injury and property damage auto insurance. You need to make sure that you have purchased your insurance before you attempt to transfer your registration. You will need to surrender proof of insurance to the motor vehicle office as a part of the transfer process. The most common form of proof is an insurance card or other type of verification that your insurance company will give to you when you purchase your new policy. You will need to have the vehicle that you need to register available for inspection by an employee of the motor vehicle office. They will confirm the VIN number that is attached to your vehicle. A county sheriff's employee can also perform the VIN validation. You also need to present a valid title or registration document from the state where you purchased the vehicle. If the vehicle is currently owned by a lending institution while you are making payments, you need to provide the name and address of the lien holder and a receipt from your purchase. If you do not have a copy of the title, you must obtain one from the state of purchase before you can transfer the registration to Idaho. Anyone who needs to transfer a vehicle registration needs to provide photo identification, as well as the vehicle documentation. Idaho registration fees vary depending on how old your vehicle is, what type of vehicle it is, the vehicle weight, and the inspection requirements from the specific county you live in. General automobile and light truck fees are $48.00 for a vehicle that is less than 2 years old. Vehicles that are between 3 and 6 years old will be charged $36.00. If your vehicle is older than 6 years, it will cost $24.00.